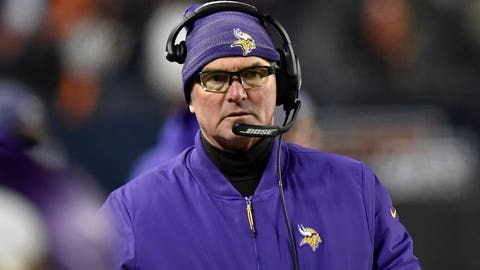 Mike Zimmer’s plan to beat the Chicago Bears went something like this: take care of the football, establish a running game and convert in the red zone. 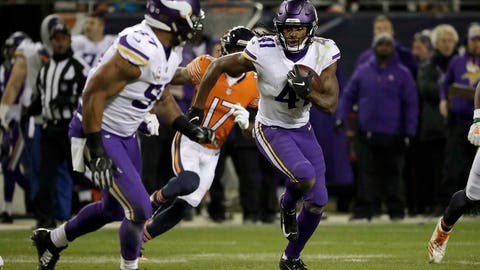 Well, Minnesota went o-fer on his requests and the Vikings suffered another loss in primetime, a 25-20 defeat at the hands of the division rival Bears. Quarterback Mitchell Trubisky made mistakes but kept the Bears offense moving with his legs, rushing for 43 yards and picking up five first downs on the ground. The Vikings defense wasn’t at its best -- there were too many missed tackles to count, especially in the first half -- but it did force three turnovers to give the Vikings a chance. Minnesota’s offense, however, managed just six points off those turnovers and was held out of the end zone on three of five trips to the red zone. The offensive line was eaten alive by Khalil Mack and Akiem Hicks, who combined for two sacks, six tackles for loss and a forced fumble. The rushing attack went absent again, as the longest run of the game was a seven-yard carry by Dalvin Cook in the first quarter. Of the Vikings’ 14 carries, 10 went for two or fewer yards, and six resulted in negative plays. It all added up to a frustrating, costly loss at Soldier Field. The Vikings are now 1.5 games back of Chicago in the NFC North with a tough three-game stretch coming up. The only reason Minnesota had a prayer in this game was safety Anthony Harris. Filling for an injured Andrew Sendejo opposite Harrison Smith, Harris intercepted two Trubisky passes -- one in the second quarter and another in the third. Harris, who was signed as an undrafted free agent in 2015, had just one career interception coming into Sunday’s game. 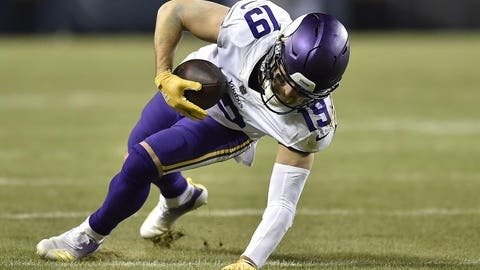 He’s now tied for the team lead with three interceptions on the season and is presenting Zimmer with a case to become the Vikings’ full-time starting safety even when Sendejo returns. Trailing 3-0 in the first quarter, the Vikings had something cooking on their second drive of the night. Minnesota had picked up two first downs and was creeping closer to the red zone. 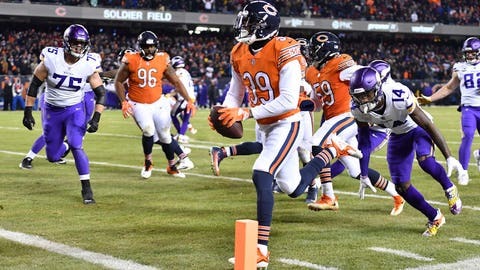 On first down from the Bears’ 38-yard line, Diggs burned cornerback Kyle Fuller on a double move and found a few yards of separation down the sideline. 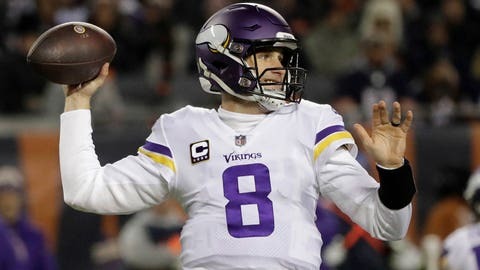 Kirk Cousins hurled a pass for Diggs in the end zone, but he overthrew the ball by a few yards and the Vikings missed out on six easy points. Six plays later, Cook fumbled the football and the drive ended without any points. It’s worth pondering what the game would have turned out to be had the Vikings claimed an early 7-3 lead. 1,000 -- Adam Thielen was quiet for most of Sunday’s game -- he was held to seven catches for 66 yards, and most of that came in garbage time. But the 66 yards was enough for the Minnesota native to surpass the 1,000-yard mark on the season. He’s just one of two Vikings receviers to log 1,000+ receiving yards in just 10 games, joining Randy Moss in 2003. Thielen is now responsible for the Vikings’ only two 1,000-yard campaigns since 2010, as he broke a seven-year drought with 1,276 receiving yards last season. Things don’t get any easier for Minnesota. 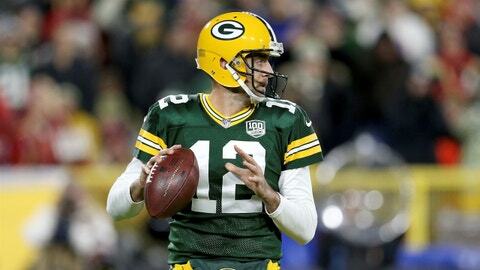 The Vikings host Green Bay at U.S. Bank Stadium for another Sunday night showdown next week before traveling to New England and Seattle to take on a pair of playoff teams. This upcoming three-game stretch will define the 2018 season.